The sequel to Peter Huddleston & the Rites of Passage (2014) finds its hero learning behaviors suitable for a prince, including staying alive. Last summer, Peter’s father took him from their drab life and brought him to aunt Gillian Willowbrook’s Hillside Manor. At the incredible estate, the teen discovered that Gillian was a queen (as was his mother) and that he was heir to the throne of Galadria, a parallel realm full of golden wonders. Now, with a year of middle school on Earth behind him, Peter has returned to Hillside Manor. He’s already accomplished the tricky Rites of Passage, proving himself worthy of the Galadrian people; he must now prepare for the deluge of attention, as prince, he’ll receive from the Golden Realm’s average citizens and media. 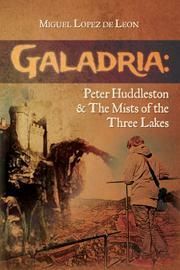 Peter meets his aunt’s trio of personal assistants, the Mists; the three women wear exotic veils that disguise them, and Peter is told they each govern a lakeside town in Galadria. Yet he senses that the Mists are central to a deeper mystery. He’s also aware that Knor Shadowray, rival to the throne, is still at large after trying to assassinate him last year. This second volume of author de Leon’s trilogy is a daringly different animal from its predecessor. Though it starts in the same wacky vein as Rites of Passage, the narrative begins simmering with adult themes that may require patience from younger readers. Peter spends many chapters practicing his princely etiquette in speech and attitude, and his primary conflict for two-thirds of the book is how the media views him; the threat of Knor remains far in the background. At its most adult, the story presents the oracle Alenia, who has impressive advice for Peter: “Do not keep pushing yourself….Give yourself the luxury of time. You will make mistakes….But what you need to do, for yourself, is learn to balance the challenges set before you.” The finale here is an astonishing boiling-over of events—and a third book awaits! Mature YA fantasy full of wondrous themes and characters.